The government yesterday advised gas station owners to set petrol and diesel pump prices at 4,000 riel ($1) per litre until November 15, which means gasoline retailers would absorb 160 riel (four cents) of the cost of crude. The government should start refashioning its institutions and policies as soon as possible to adapt to the fourth industrial revolution (4IR), which is already impacting all aspects of Cambodian society in ways that are hard to anticipate, an Asian Development Bank (ADB) economist said Friday. The Sihanoukville Special Economic Zone (SSEZ) will seek listing in the Stock Exchange of Hong Kong and the capital raised will mainly be used for the development of real estate within the industrial park, said president Jack Chen. Boring is best when it comes to business or so says Piet Holten, a Dutch entrepreneur who credits “normal” working conditions for helping to grow his textile factory in Cambodia. Cambodian Prime Minister Hun Sen said Sunday that counterfeit medicine is a masked murderer of people in remote areas as this medicine is not only ineffective in treatment, but also harms consumers. Three ministers will later this month meet to discuss amendments of the forestry law, and the law on natural resources, to pave the way for decentralisation in order to transfer more decision making power to sub-national levels. Cambodian Prime Minister Hun Sen rejected the statement of the ruling Cambodian People’s Party (CPP) spokesman Sok Eysan for saying former President of Sam Rainsy Party Kong Korm is the spy of CPP. The Agriculture Ministry has issued a report showing that in the first nine months of this year there were 846 cases of forestry crimes, down from 963 during the same period last year. Kong Korm, former president of the Sam Rainsy Party, said that those who are concerned about the withdrawal of EU’s Everything But Arms (EBA) scheme from Cambodia tried to pollute the society and intimidate the workers, speaking in an interview with Vayo radio on Sunday. A group of Cambodian government officials have been chosen to participate in a training programme on monitoring and evaluation (M&E) in Korea organised by that country’s development agency. The Vietnam-Cambodia Friendship Monument was inaugurated on November 3 in Ratanakiri Province which is located in the Northeastern region of Cambodia and shares border with Vietnam’s Gia Lai and Kon Tum provinces. There were about 1.8 million documented and undocumented migrant workers working overseas in the first six months of this year, an increase of nearly 20,000 when compared to the same period last year, according to the National Committee for Counter Trafficking. Anti-economic crime police stopped a truck smuggling chicken legs and wings in the capital on Saturday and issued fines against those transporting the tainted, untaxed meat. HLH Development Pte Ltd, a subsidiary of publicly listed Hong Lai Huat Group Limited, yesterday entered into a joint venture agreement with local conglomerate Royal Group of Companies to launch a mixed development project in Phnom Penh. The number of people being held in Cambodian prisons has reached epidemic proportions, leading to overcrowding and corruption, and causing families to suffer unnecessarily, claims a report by local NGO Licadho. The Cambodian Commerce Minister last week appealed to businesses in New Zealand to consider the Kingdom as an investment destination. Speaking in a courtesy call on Cambodian Prime Minister Hun Sen on Sunday at Peace Palace, Jean-David, a French diplomat who took part in the 1991 Paris Peace negotiations for Cambodia, admired Cambodian development on his visit to Phnom Penh. NATIONAL Assembly spokesman Leng Peng Long on Wednesday threatened unspecified “action” against the Inter-Parliamentary Union (IPU) if “extremists” violated Cambodian sovereignty, as the body hit back at claims of interference by saying it was simply insisting on “due process”. Ruling Cambodian People’s Party spokesman Sok Eysan said on Thursday that the political situation in Cambodia is making “good progress”. He accused “local and foreign dogs” of trying to intimidate and mislead people into thinking the contrary. Cambodia’s world-renowned precious stone and silver craftsmen and jewel designers were notably absent from the fifteenth Wuzhou Jewel Festival, held last month in China’s Wuzhou city, lamented a spokesperson. A model wears a dress made out of recycled material during a show organised by LGBT fashion designers to battles discrimination in Phnom Penh, Cambodia, October 24, 2018. Three primary school children scored themselves a brand-new gadget each, after showcasing brilliant financial literacy prowess in Maybank’s battle-of-the-wits on Saturday. Six months after he was deported to Cambodia, a country he has never visited and a place his family fled as refugees more than two decades ago, Phorn Tem returned Friday to the United States and his waiting family. 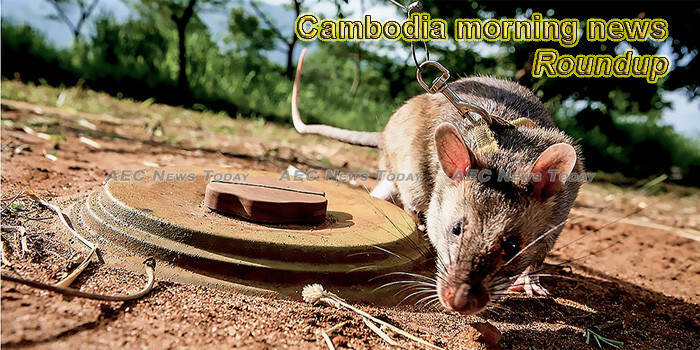 This week’s Cambodia morning news feature photo acknowledges International Day for Preventing the Exploitation of the Environment in War and Armed Conflict, November 6.